For anyone that has spent time exploring the shores of Hurricane Island, the evidence of the past inspires intrigue and wonder. The history of the community and town that once existed is evident in the granite foundations, hand-dug wells, the granite artifacts that were discarded along the roadside and the aging industrial infrastructure that was erected to support the granite quarrying operation. The reason the town existed, complete with a schoolhouse, town hall, bowling alley, and general store, was because of the geologic history of the island and the wealth that the stone provided as construction material for the rapid growth of buildings and monuments along the eastern seaboard of the United States in the latter years of the 19th century. Although the primary reason a town formed on this offshore and otherwise less than hospitable environment was due to geology and the economy of granite, those factors alone didn’t create the community on the island, it was the people. A company town composed primarily of immigrants from Italy, Scotland, Finland, Sweden, Ireland and beyond, it was a town with great diversity of language, culture, customs and religion. The integration of such diversity had it’s controversies and challenges, but it also was characterized by civility, harmony and togetherness that are at the heart of the community that thrives on Hurricane even today. Hurricane Island Catholic Church, circa early 1900's. General Tillson, owner of the Hurricane Island Granite Company, was known by nicknames such as “Lord of the Isles” and “Bombasto Furioso”, both hinting at a level of tyranny and oppression in his rule. However, amidst Tillson’s reign and oversight, tenants of life and community prevailed and people were allowed to gather, to dance, to celebrate and to worship. Tillson allowed for interdenominational services of religion to exist on the island and allowed gatherings upstairs in the town hall on Sunday evenings. Although there was great diversity among the religious affiliations of the immigrant population, over time the Catholic population began having services of their own. In 1900 the Archdiocese of Portland decided to build a church on the island and once a month a priest from St. David’s Church in Rockland came to Hurricane for Sunday service. 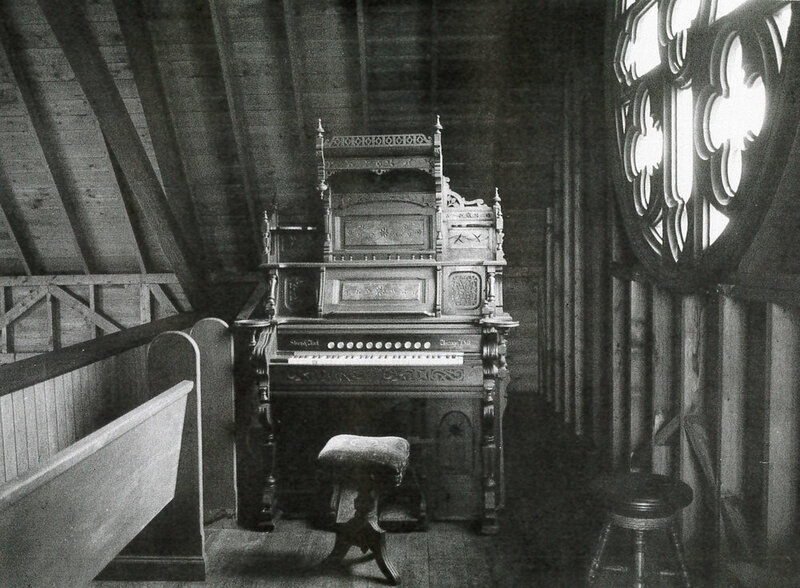 Sometime after the church was built, a Story and Clark pump organ was brought to Hurricane and for the duration of the time that a community lived on Hurricane, the organ resided in the Catholic Church as the musical centerpiece for prayer and worship. As the story goes, the granite town and community on Hurricane ended abruptly in November of 1914 (for various reasons, including the competing economics of concrete vs. granite as a building material) and the island was all but completely abandoned. In the years that followed, the buildings and equipment on the island were parceled off, dismantled and transported to nearby islands and to other towns across Maine. The Story and Clark organ, church pews, alter, and chalice were brought to North Haven Island and became fixtures there for the last 100 years. Several years ago, we heard that the Catholic Church on North Haven was for sale and in 2015 we contacted the Diocese of Portland Maine to inquire about the organ and other artifacts that once resided on Hurricane. We discovered that the church on Hurricane was still listed in their registry and they were pleased by the idea of the organ returning to Hurricane and becoming part of our historical archives. In the early fall of 2016, Sam, Oakley, Silas and Josie ventured over to North Haven and reclaimed the Story and Clark organ from the balcony of the church on North Haven and transported it back to the Galley on Hurricane, the building that now sits on the foundation of Hurricane’s former Company Store. Despite being over 100 years old, the organ only needed a few minor repairs and still plays beautifully. Although it is regarded as an artifact and antique, on occasion we have allowed some visitors and staff to work the pedals and fill the room with the hypnotic sound. The spruce trees that have grown up, the rocks have weathered, and the original church building on Hurricane has disintegrated since the granite community left the Island. Despite this passing of time, the foundation to the church still exists imparting a sense of reverence and calm, allowing us to see and feel the history of the island. With the return of the organ to the island it is now just as easy to hear the history and experience Hurricane’s power at an even deeper level.